I grew up in New York City. The Bronx, to be specific. Freezing cold winters, hot and shvitzy summers. 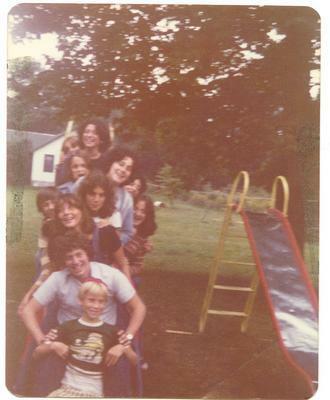 My parents, like most of the New York Jews of the 50s, 60s and 70s, would pack up a small version of their entire house, pots, pans, bedding and birdcages, and shlep up to the Catskill Mountains for over two months of fresh air and the chance to experience a unique sub-culture. This was a time before cable TV. 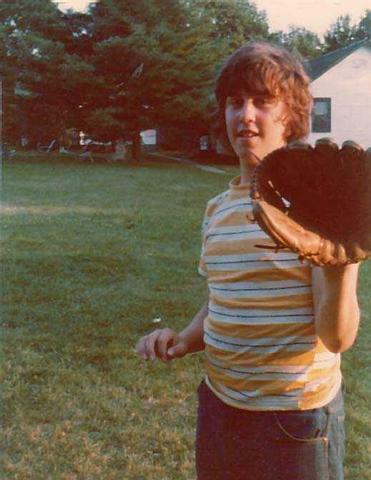 A time before the ubiquitous air-conditioning of our environment, before cell-phones and computer games. We would rent a small bungalow somewhere in Woodbourne, or Ferndale, or Liberty, somewhere in Sullivan County. My father, like almost every father, would come for the first two weeks, and when his vacation was over would go back to the city alone for the work week, coming up on Friday for the weekend. I would join the group of kids waiting by the mailbox, waiting for Daddy to come up the road. During the week the dads would call the pay phone on the Main House porch to speak to their families and Arnie’s mom would make the announcement over the PA system: telephone call for Silverstein, Silverstein, you have a telephone call! My mother would set up house in the bungalow. She would shop for groceries, cook and clean, do the laundry and make sure my brother and I didn’t go swimming for at least an hour after we ate. And my brother and I? We would run wild! It’s amazing how little parental supervision there can be when you spend your days playing baseball, running through the woods and playing Capture the Flag at night. Mornings were spent playing baseball on a diamond built by God. Really, I’m not kidding. The placement of some submerged flat boulders was a brilliant simulation of first, second and third base. Home plate was right in front of a thorny berry bush. You had to be careful that when you slid home you didn’t slide into the bush. And while you were waiting for your turn to be up at bat, you noshed on the berries. The swimming pool was a lawsuit just waiting to happen, but it never did. No lifeguard, no bathing caps required (but Lisa wore one anyway), snakes lurking by the deep end and everyone recklessly climbing on top of the ladder handlebars and diving off. In between challenging each other to see who could hold their breath the longest or pull my brother’s swimming trunks down, we would lie in the sun, never having heard of sunscreen, munching on sandwiches and ripe, juicy plums that our mothers brought down from the bungalows. 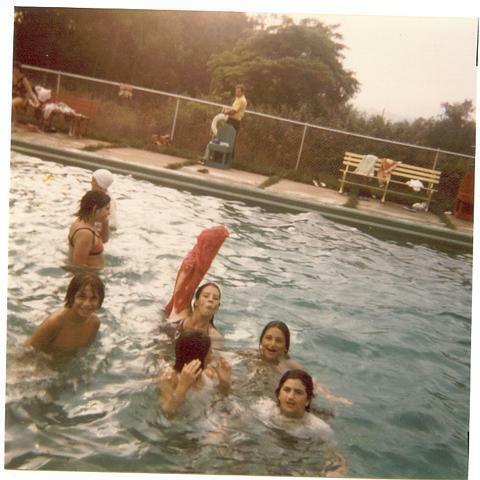 We’d be back in the water as soon as we could after that, one hour after eating if our moms hung out by the pool, sooner than that if our moms decided to escape to the shade of the trees in front of the Main House and play some cards. Sometime around 3 PM Ruby the Knish Man would drive up in his van and we would all climb out for a hot potato or kasha knish. In 1975 we all saw the movie Jaws, and while it didn’t deter us from jumping back in the pool, a new game was born and even the chlorinated waters of the Blue Paradise bungalow colony were never safe again. Our moms would have to shop for the week at the Giants supermarket, a 45 minute walk down Old Monticello Road, right next the Sullivan’s department store and a little way over from the Howard Johnson’s diner with the orange roof. Most of us didn’t have cars up at the colony, since our father’s needed them to get back and forth from “The City” every week. It was all downhill to Giants, but it was all uphill back to Blue Paradise, so you really only wanted to make the shlep once a week. 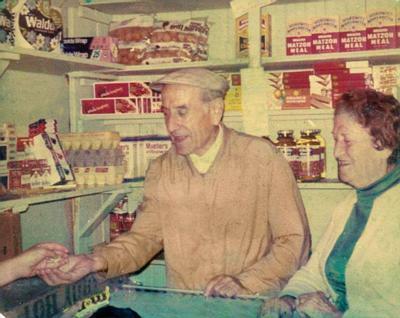 And if you ran out of milk or eggs or needed another pack of cigarettes (like my mom) or another pack of playing cards (like Debbie’s mom, or Debbi’s mom) you could always pop into the small store run by the Schulmans. Mr. and Mrs. Schulman were Billy’s grandparents. I don’t think we ever knew their first names. They ran the little grocery which was just off the side of the Main House porch. There you could buy your milk and eggs, and also your Sugar Babies and potato chips to nosh on Tuesday night, which was movie night at the casino. They had the best cinnamon buns, Cinnabon wouldn’t hold a candle to them today. You can see the box that held those buns in the picture to the left, in the bottom corner on the left. They were covered by a flimsy piece of plastic that never kept the flies out. Those buns were one of my favorites, they only cost a quarter, and in my 11 year old mind they were heaven. The only thing more heavenly than those buns were the Creamsicle ice creams. They were made by the same company that brought you the Popsicle and the Fudgesicle. The Fudgesicle was delicious but that Creamsicle was divine. Orange and vanilla flavored ice-cream on a stick, my mom would always let me buy one on Monday nights, just before kiddie-bingo in the casino. Taste is one of the strongest memories around, and the taste of that Creamsicle has stayed with me since the last time I had one, in 1976. By then I was a jaded teenager. I’d seen R-rated movies (The Omen still scares the poop out of me), I’d smoked stolen cigarettes with my friends out behind the handball court, and I’d snuck into Grossinger‘s hotel and rowed on their lake without being a paying guest. But the taste of a Creamsicle will take me back to the days when the highlight of my day was playing hide and seek on the Main House lawn, when I couldn’t wait for the cartoons to be screened in the casino on Tuesday night, and when I stood their waiting by the side of the road on a Friday evening, waiting for my Daddy to come home for Shabbat. I have never found Creamsicles in Israeli supermarkets, not even during American week at the Supersol. Not even in Meatland, and Meatland has all the fun and yummy stuff from the States. Sometime in the late 80s I decided that if I wanted to relive my orange and vanilla summer memories, I would have to make the stuff myself. So I did. Add the vanilla pudding, whip again. Add the frozen orange juice concentrate and the vanilla. Whip again. Add as little or as much food coloring as you dare. Or none at all. 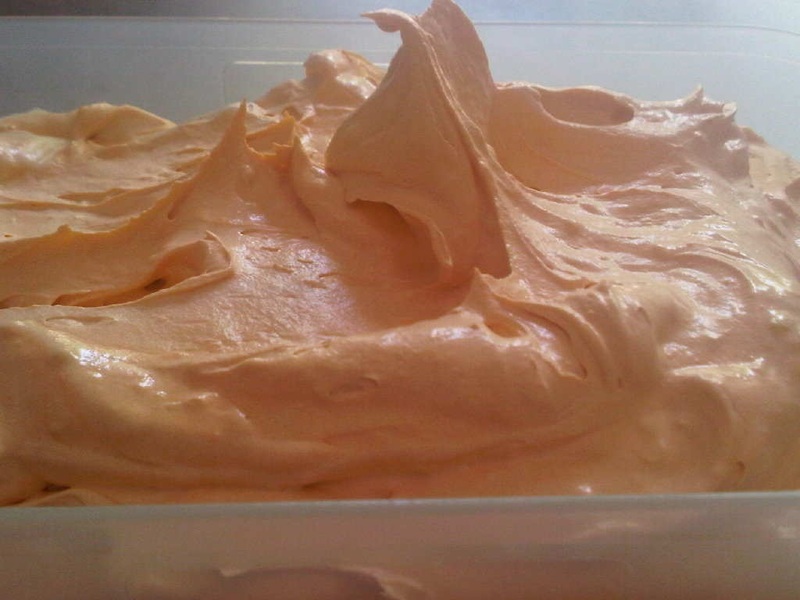 Transfer the whipped deliciousness into a Tupperware and place in the freezer for 6 hours or overnight. Serve frozen, and remember your childhood. Posted on 23 June 2011, in Citrus, Dairy, Dessert, Family Life, Vacations and Travel and tagged bungalow colony, Catskills, cooking, Creamsicle, dessert, ice cream, kosher, recipe. Bookmark the permalink. 23 Comments. Actually, Debbie (whose mother plays cards in the post) sent this to me the other day. We’re all gutted, like the hotel itself. What a beautiful and nostalgic post. Makes me want to get in the car and head to the mountains. Such simple pleasures. I used enjoy dreamsicles (or were they creamsicles) as a kid. We walked to a neighboring drugstore to get them from a large refrigerated chest with a glass panel – you could look in and choose your ice cream on a stick or one of those nutty, wrapped cones. I can’t imagine wanting to recreate them! I love the photo with the grandparents and the non-refrigerated eggs. Sounds like wonderful memories you have. Lovely post. Very evocative. Like sending us a postcard so that we can wish we were there. This was a really great post. It reminded me of our summers in Lake Peekskill. It wasn’t a bungalow colony, but there were four attached little houses, with four families. We kids could all contact each other through the bathroom ceilings, which had great sound. We had rollerskating one night, basket ball, arts and crafts, etc. We could swim across Lake Peekskill to North Beach, or walk down the secret path to the beach. All our dads played poker Sunday afternoon, while the kids watched from a distance. We had ping pong and volley ball on the lawn. Mom went each Saturday to town to do the laundry and food shopping. 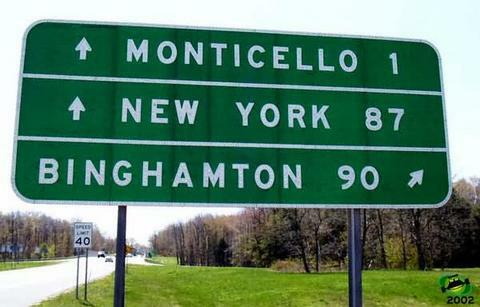 The big thing with the dads was, how long did it take them to get to us from the Big Apple rest stop. The shortest time was the pride of the dad and his kids. We waited for dad at the top of the steps each Friday, and bid a sad farewell on Sunday. The big excitement for us kids was the day Lake Shore Drive became one way after being a two way street most of the year. Once summer started, it became one way, and we kids would take our lawn chairs to the street and yell at everyone who went the wrong way. Thanks Mirj, for the memories. Summer memories are great, aren’t they? And I think it was the Red Apple, not the Big Apple. My parents refused to stop there because it was “narishkeit.” Also, we never had a car, we had to rent a van to take us up there, so no speed records were set. I loved this post, and all your others (lurking until now). Where do you find OJ concentrate in Israel? Prigat makes the stuff. In my supermarket it’s in the frozen food section next to the cranberries and the puff pastry. Having grown up in the midwest I’ve never been to a bungalow colony, but after reading this post I can see why people compare life on a yishuv to a bungalow, particularly for those families where dad “commutes” to the states for work. Beautiful post! My family never went to a bungalow colony, but my husband’s family spent a couple of summers “in the mountains.” The bungalows were so small that he had to sleep in the kitchen… 🙂 Shabbat Shalom! Aha! He must have come from a large family! The four of us all slept in one bedroom (and the parakeet was in there too), although their was a hi-riser in the kitchen. Anything type of food that cost money and could be made at home was narishkeit. Nonsense. I miss Fudgesicles more than Creamsicles..last time I was in the US the challenge was finding kosher ones! Robin, living up there must have been amazing, but the winters must have been frigid! I remember wearing parkas on cold summer days. And maybe the next challenge is homemade fudgesicles? Raizy… When did you go there. I am the “Bob” of Phyl-Bob. The only surviving daughter. I spent summers of 1961-1967 at Phyl Bob, ’68 and ’69 at Syms. Better than being in the apartment in Mill Basin!! Lovely, evocative post, Mirj. Just like being there.